In a small messy apartment on Willow Avenue in downtown Hoboken that seems fit for a college student, Bill McGarvey recorded his first solo album. He used his computer, guitar, drums, and the help of a few friends. Months of work and dedication resulted in the intimate Tell Your Mother. The independent release on McGarvey's label Thievery Records is a collection of original tunes about childhood dreams, romantic memories, and hope. The title track is pop-folk with a catchy hook: "I'm gonna tell your mother/I think I found her long lost baby tonight/pretty soon someone'll turn up and spot you..."
With a Ron Sexsmith influence and a sound like Badly Drawn Boy with a John Mayer twist, McGarvey's songwriting is deep. Love song "Look What You've Done To Me" is personal, an invitation into the musician's psyche. The album's 13 tracks, engineered by Eric Casimiro and mixed by Gary Solomon, evoke feeling and demand attention. The album's final touches were done at the Pigeon Club in Hoboken. "It's a pretty personal homemade record," he said. "I recorded most of it in the middle of the night." Music is McGarvey's passion, and he enjoys the recording and mixing side of the craft. He will perform at The Goldhawk on Feb. 28 at 8:30 p.m. in support of the record. New York City band Captain Danger will open the show. McGarvey is the youngest of five children raised in Philadelphia. He attended Georgetown University, where he earned a degree in English. His interest in music began early when he banged a drum set and started to jam in his room as a kid, listening to Bruce Springsteen, Elvis Costello and Bob Dylan. Eventually he learned guitar, and writing songs came naturally, he said. "I went to a bunch of live shows, and they really blew my mind. I really wanted to try that," he said. Tell Your Mother may have taken a few months of production, but it has been a decade-long journey for McGarvey. After moving to Hoboken in the early '90s, he played drums with different area bands before finding his groove with Valentine Smith. After several years of playing and after releasing three albums, McGarvey left the band two years ago to work on his projects. 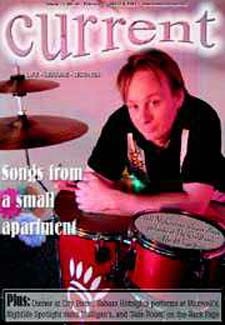 He spent many weekends playing gigs at local pubs and small clubs rehearsing songs. "I wanted to see the crowds's reaction to the songs that would eventually be on the record," he said. Without big backing from a label, he stopped procrastinating to make Tell Your Mother. For the first time in a long time, McGarvey captured the sound that mattered most - his own. Despite laundry on the floor, scattered books, and basketball souvenirs throughout his tiny living room, McGarvey used whatever equipment he had to temporarily transform his living space into a recording studio. Friends like Kimberly Nordling (violin), Stephen Dima (songwriter), Thomas Novembre (guitars), William Paris (bass) and Eric dePicciotto (guitars) came out to help McGarvey with the record that was "recorded in the kitchen and mixed in the living room." The collaboration resulted in a quality worthwhile compilation. Tell Your Mother is creative and surprisingly entertaining. More importantly, it gives McGarvey a vehicle to gain the exposure he has worked years to achieve with Valentine Smith. After sacrificing his savings, he is hoping the record catches the attention of people and labels. He also hopes the album can overcome the current saturation in the music industry. "I'm allowing myself to dream big, but making a living on it is a good thing," he said. "You don't have to sell a million records to make a living. I want to break through the noise." Whether he likes it or not, McGarvey is an ambassador of the mile-square city's pop-rock scene. He has seen bands come and go, like his own. Despite other Hoboken bands like Eugene, High Speed Chase, Rye Coalition, and They Fought Back, the scene today differs from the early '90s, he said, because kids are not forming bands like they used to. "Living in Hoboken has become so expensive that nobody in a band can afford to live here," he said. "If I was coming out of college now, I wouldn't move to Hoboken because I couldn't afford to." Fran Azzarto, The Goldhawk's owner, met McGarvey when the drummer first moved to Hoboken. They ran into each other often with their bands, and now McGarvey is a regular at the venue. "He is a good guy and a talented singer/songwriter," Azzarto said. "He brings in the crowds and we like having him around." Since McGarvey's tenure at The Goldhawk, his "home away from home," he has brought in musicians like Ben Arnold and recent Grammy-winner Jesse Harris. During his live shows, he plays many originals while adding a Beatles or Pretenders cover. Hoboken's Cultural Affairs director Geri Fallo has booked McGarvey for several summer concerts in recent years. "I love him. He is tremendous. More people should discover his music," Fallo said, during a recent interview. Information on McGarvey is found at www.billmcgarvey.com. He will play The Goldhawk this Friday at 8:30 p.m. The Goldhawk is located at 936 Park Ave. Their number is (201) 420-7276. Tell Your Mother is available at local music stores and online.